Al Capone Speaks On Film! No, it is not his voice recording. I have been asked this many times over my over three decades of research into the Big Fella. Lots of people have wondered if there existed any voice recording of Al Capone? Unfortunately, I'm here to tell you there are none. Some people have speculated what he may have sounded like. Even a relative got a guy to record something whom she thought Al would have supposedly sounded like. 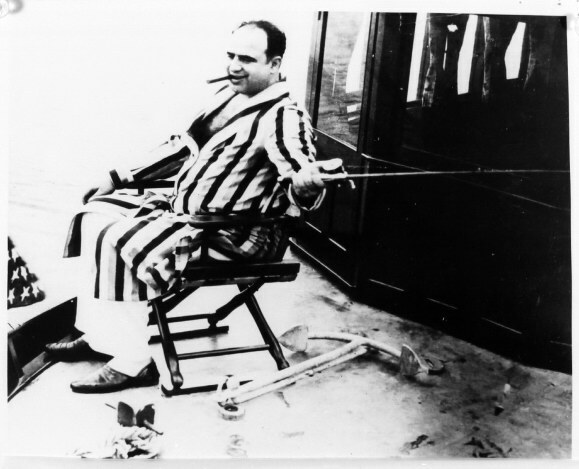 This web page is here to find out what Al Capone did say while he was being filmed in 1931. Al Capone at the races in his box seat Washington Park 1931. The actual photo from above newspaper story. What is Al Capone saying? 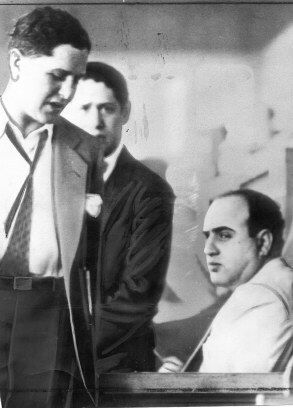 Mae Capone looking on as Al rants to his men. The American Derby, Washington Park Track, Chicago, June 20, 1931. Some guy with a camera was documenting Al's presence. Al was sort of pissed off. About a couple of boxes away sat none other than George E.Q. Johnson, who was getting ready to prosecute Al Capone for his income taxes. Johnson was quite peeved to see people in awe of Al Capone there and to see Al getting the attention of a celebrity. 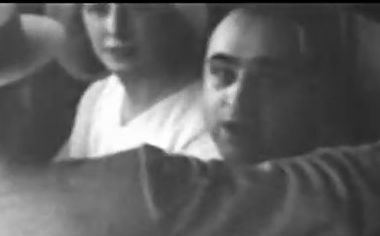 Click on photo to see short clip of Al Capone saying something to his entourage. Capone does not swear as he is mindful of Mae Capone's presence. Can you guess what he is saying? What Al says in this clip.
" The guy with the binoculars is looking at us guys!" This story of Al being out and about town spending money while claiming no income started even before the St. Valentine's Day Massacre of 1929. Authorities want to question Capone on various crimes in Chicago. One example is that Capone friend and acquaintance Pasqualino Lolordo is murdered in his home. Capone's presence is first requested January 12- 20, 1929. Capone tells his lawyers to relate to the court that he is very ill with pneumonia. Things are now heating up even more in Chicago. Chicago authorities are now really eager to question Al Capone about the massacre. Al Capone had a rock solid alibi for February 14, 1929. At the very moment the massacre was going down, big Al was being questioned in Miami by New York Assistant District Attorney Louis boldstein and Dade County Prosecutor Robert R. Taylor. This questioning was surrounding the death of Frankie Yale and the Arnold Rothstein. 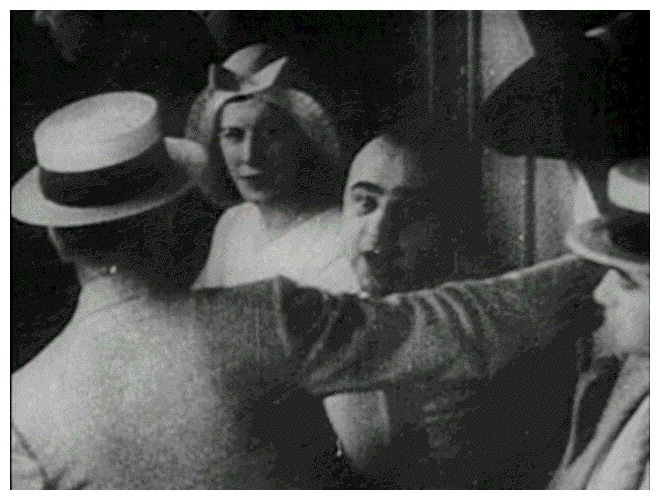 Even with the air tight alibi, Chicago Authorities still insisted to see Capone to answer some questions. George E.Q. Johnson finally subpoenaed Al Capone on February 21, 1929. 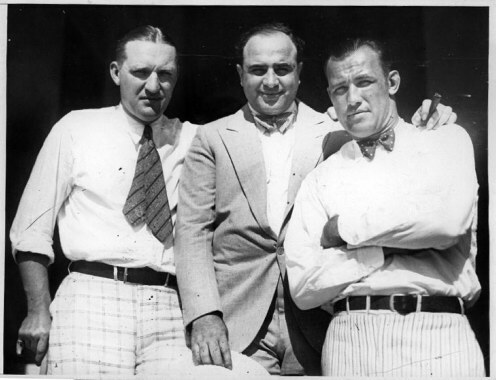 Al Capone in Miami with sports writer Bill Cunningham and boxer Jack Sharkey in February 1929. Capone lawyers William F. Waugh and Benjamin Epstein petitioned the court to buy Al Capone some extra time because Al had been very sick from January 13 to February 23 and could not make it back to Chicago. They had asked for an extra month and presented Judge Wilkerson a signed certificate by Al Capone's personal physcian Dr. Kenneth Phillips. The Judge agreed to give Capone only 8 more days and he would be subject to a medical examination by a court approved Army physician. If Capone did not agree to this then he would be held in contempt of court. 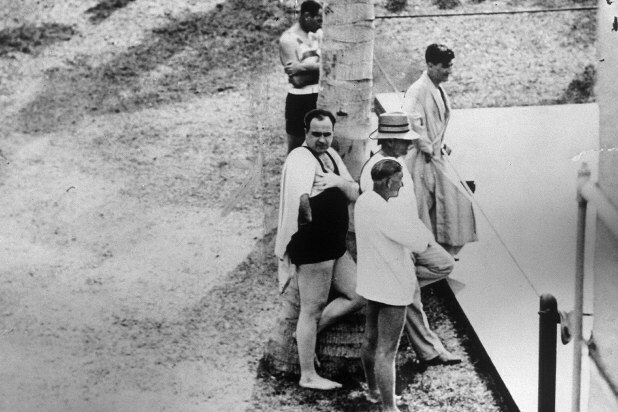 The grand Jury was getting info that Capone was a man about town while in Florida and attending the races instead of being sick in bed. He even held a party following the St. Valentine's day massacre and took a boat ride to the Bimini Islands. Before finally giving in to the Grand Jury inquiry, Capone mentions that he is afraid that the Chicago police will harrass him or that he will be assassinated by rival gangsters enroute to court and wants guarantees for protection. Captain John Stege and Herman Bundesen ease his worries and he is escorted by officials to and from the court. 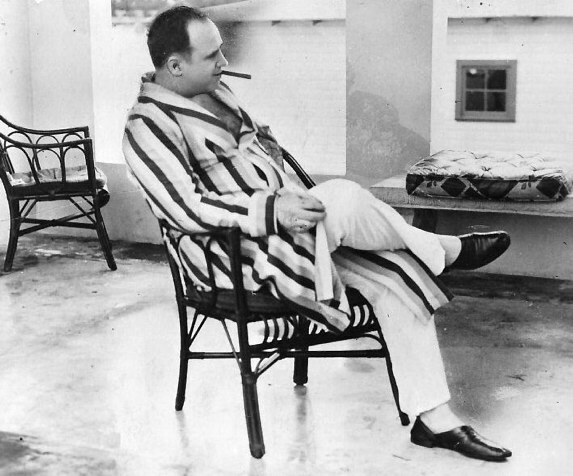 Two photos of Al Capone at his Miami home. These are often mistaken as being taken later when he was suffering from paresis. In actuality, these photos were taken in April of 1930, a month after his release for his gun toting time served at the Eastern State Penitentiary in Philadelphia. He wanted the press to show he was a peaceful Miami citizen that retired and out of the rackets. 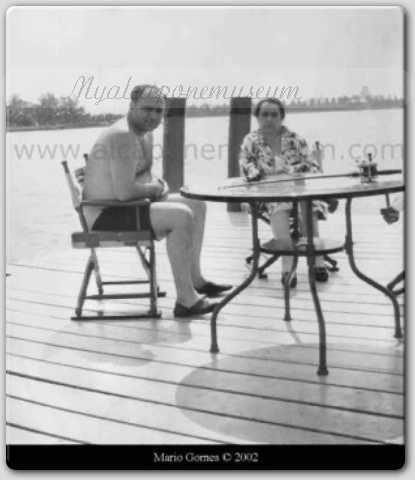 Al Capone relaxing in the sun with his mom on the dock of his Florida Mansion 1946. Note the fishing pole on the table. No, he's not drooling and fishing in the pool as the legend has it. The extent of his sickness would make him some days act like a child. He would easily get excited when visitors would come over, whistle, chew gum, talk real fast, all in succession or would get real upset if someone would leave after a visit. The only annoyance was the occaisional touring boat that passed by with gawkers wanting to look at Al. On days when Al wasn't feeling too well he was taken out for some fresh air on the boat dock. Sometimes he had to be taken in once the boat tours started passing by. 3 hour, 35 mile boat tours were offered that also passed by the back Al Capone's house. This booklet with photos of famous houses was given or sold to passengers as asouvenir. 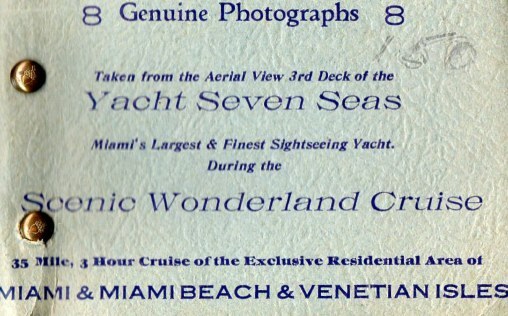 This particular booklet was obtained on a boat tour taken on December 5, 1941. Capone stalls until March 20 - 26, when he finally appears in two Grand Jury inquiries about various crimes, subjects along the lines of Dyer's union wars, Chicago Height alky trade and the massacre. Meanwhile, the government prosecutors secretly rack up liquor violation charges against him. They also look into the Yale and Rothstein murders and try to tie him in. They investigate the St. Valentine's day massacre and try to see if he is involved in any way shape or form. While he had a solid alibi being in Florida, authorities are still interested in knowing why Capone received a flurry of long distance phone calls from Chicago before and right after the massacre? Just in case they can't nail him on any of those charges the Government also adopts the tax angle which successfully landed Nitti, Guzik, Druggan and his brother Ralph in prison. They are now in possession of Capone receiving monies. 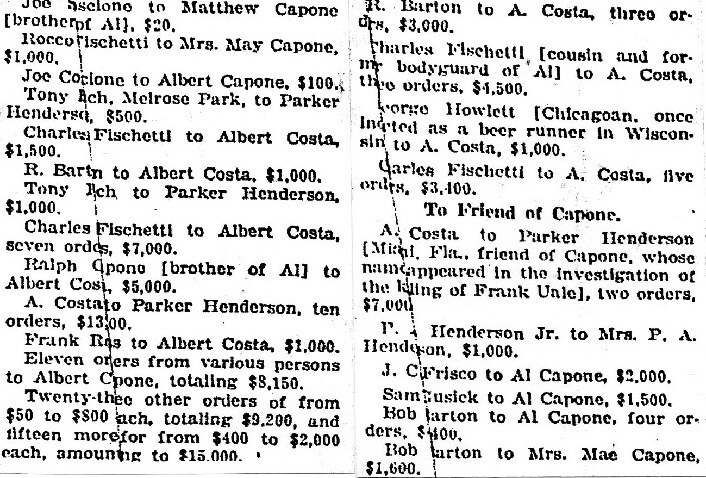 Money transfers made directly and indirectly to Alphonse Capone for the year 1928-29 uncovered by investigators. These were found during Ralph Capone's income tax trial investigation. 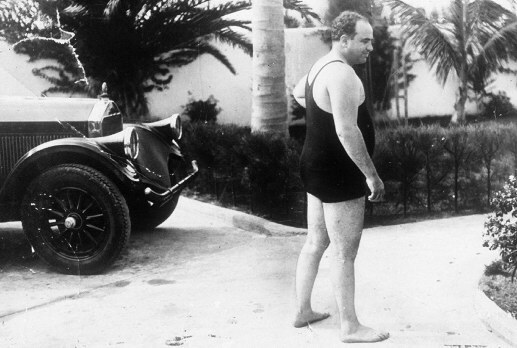 Capone annoyed by the harrassment of the Grand Jury and the press the massacre has brought him. He decides to get some peace by getting arrested in a Philadelphia theatre on a gun toting charge. He does a year in the Eastern State penitentiary. Al Capone thinks he can get away by disappearing for a while and that they will stop hounding him, but he is mistaken. The law does not forget! It merely goes dormant all the while accumulating more evidence against Capone. After Capone leaves the Eastern State Penitentiary in 1930, he immediately makes plans to visit Cuba. After two years of evading the authorities in Chicago, Al Capone finally shows up again in Chicago. On the stand and under oath the prosecution tore apart testimony by Capone's Doctor and nurses who had lied in order to make Capone sicker than he was back in 1929. Capone is indicted with contempt of court for lying about his sickness. February 27, 1931, George E.Q. Johnson successfully convicts Al Capone to 6 months for contempt of court for lying about his illness in order to avoid being questioned by the grand jury. Capone chews furiously on his gum. 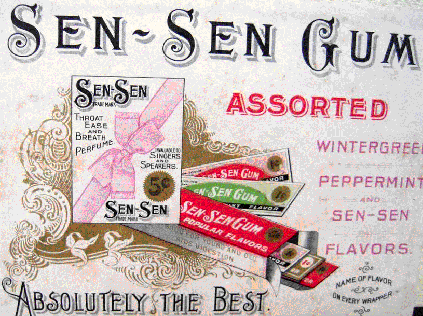 Al Capone's favorite gum. He went through a lot of it in court during trial and after he was released from Alcatraz/ Terminal Island. Capone is fingerprinted, photographed and released on $5000 bail. 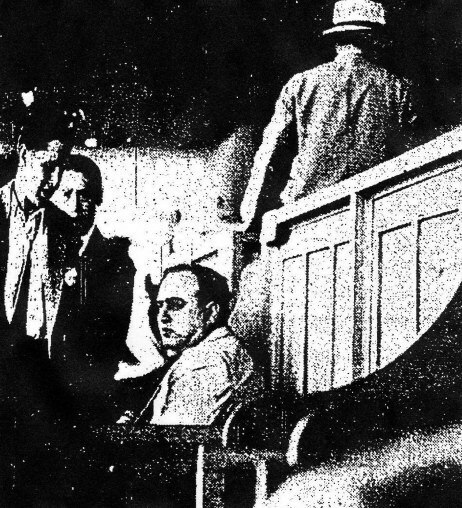 June 16, 1931, Al Capone returns to court under armed guard. This time he is facing two indictments. One of tax evasion and the other on liquor violations. Capone's lawyers were trying to get a plea deal that would put Capone away for two years in Leavenworth. July 25, 1931, Al Capone knowing he will soon be doing prison time throws a big party in Benton Harbour Michigan. July 30,1931, Al Capone is shocked to hear that Judge Wilkerson will not accept his plea deal of two years and he will be tried accordingly on all the charges and evidence put to a jury. Thank-you to Sandrine Ourvouai who gave me the inspiration for this web page.